A healthy snack of baked zucchini sticks with a crispy cheesy coating. Serve with your favourite marinara sauce for dipping. I have been tying to clear some space in my freezer lately and I came across some marinara sauce that I had made a while ago. It is always nice to have some marinara sauce on hand and it freezes well so I tend to always have some in the freezer. Going through my bookmarks I came across a tasty looking recipe for baked zucchini sticks on For the Love of Cooking that sounded like a tasty way to enjoy the marinara sauce. I liked this recipe because it used courgettes and because they were baked or roasted rather than fried. 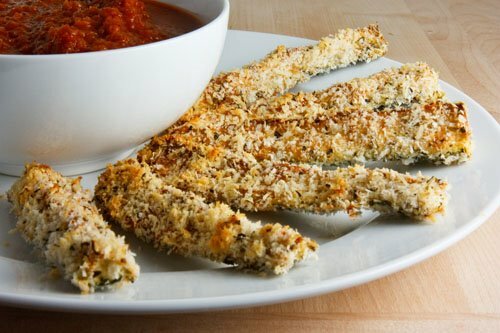 These baked parmesan crusted zucchini sticks were easy to make and turned out great. They were golden brown and crunchy on the outside and nicely roasted on the inside. The zucchini sticks were tasty by themselves but they were even better when dipped in the marinara sauce. Mix the bread crumbs, parmigiano reggiano and oregano in a bowl. Season the zucchini with salt and pepper. Dip the zucchini in the egg and then dredge in the bread crumb mixture. Place the zucchini on a baking sheet in a single layer with the skin side down. Bake in a preheated 425F/220C oven until golden brown, about 20-25 minutes. just brilliant! this would work with several types of veggies. a great idea kevin! They look crispy and delicious! A great healthy snack! A gorgeous idea! That healthy recipe sounds delicious… Perfect! Yum – These look delicious Kevin. Thanks for sharing. I am so excited to have you part of the ebook. I love healthy indulgences. These look terrific! The combination of crispy zucchini with marinara is making my mouth water. Yum! Classic treat – love that they’re baked!! oh these do look good and full of crunchy topping! They look crunchy and delicious! That’s a great parmesan crust. I host Bunco Friday night and I will be making these! How many do you think 25 wine drinking ladies will eat? I am drooling 🙂 Can’t wait till the markets are open with fresh veggies, I imagine this would work for a variety of squashes…yum! OH WOW!!! I also love that they are baked…YUM….thanks! What a great evening snack or appetizer! Kevin you must stay out of my head!! I just made this Tuesday Night and have not posted yet.. But I used Panko Bread crumbs and they were incredible – I found the recipe in Prevention Magazine..I served with ranch dressing and they were incredible!! These look delicious, Kevin! A great way to use up leftover marinara! This is one of my favorite ways to have zucchini! I’m glad you’ve discovered it. These look great and I love that they are baked! Ummm, I’m pretty sure I am going to make that today! Thanks Kevin! What a healthy snack or as a side dish to a main meal. I too love the idea of them being baked instead of deep fried. i love zucchini and so i will have to try this! i rarely make zucchini sticks because they are fried! Yum! These look very nice. Mmmm, good good. You could really healthify a tempura dish with panko too. Looks yummalicous, as my daughter would say–a good way to get her to eat some vegetables since she loves Parmesan. We make a Parmesan Chicken, which is a real keeper. You can check it out on my brand new blog. I have a favorite recipe very similar to this, except the zucchini are in coins, or “chips.” They really are the best– in my opinion, they taste so much better baked than fried!! You have reminded me that I have not made any zucchini sticks for my kids in ages-thanks for soem of the new ideas also. oh wow those look great -super crispy looking! thanks for the recipe! Just bookmarked—these look so great, and faux-naughty. One of my favorite things in the world is Fried Zucchini. And these look better and would suit my new diet better. These look amazing! I love fried zucchini, but I don’t love the fat that comes along with it. that looks fantastic! i love zucchini and this looks like a fun way to serve them. thanks for sharing with us! I always enjoy your photos and these zucchini sticks look delicious. I just wrote two blogs about zucchini too – both breads though, so this is a nice change. YEP! Definitely making these this weekend. I heart zucchini. Thanks for yet another GREAT recipe Kevin! Kevin, i just made some marinara sauce from the tomatoes that i canned last summer. I have stashed in the freezer. Great idea! Hum, this sounds really good, I love that they are baked, versus fried. I wonder if they get mushy inside though. I love that they’re baked. Yum! Thanks for the shout out Kevin. I really need to make these again – yours look AMAZING! I saw the picture of these on tastespotting and couldn’t resist clicking through — they look absolutely scrumptious! I wish I had some marinara in my freezer for these guys! Definitely going to need to try them soon though. This is one of my favorite snacks. I saw Giada make it a few years ago, and have been hooked ever since. Yours look great! I wish I had these sticks to munch on now! they look fantastic! As we all know I am not a fan of veggies, however I think I could really get into these. Oh, this does sound good. What a fine way to enjoy zucchini. Delectable idea (can I say that)?, anyway what I mean is, that’s such an awesome idea, worth trying Kevin. I remember these from Pam’s amazing blog. Yours look terrific. I bet they had great crunch! look at those crumbs! It will nice for a party by using a few different types of vegetables. it will be great party food! Delicious and healthy with the veggies. And Baked too! This is a fantastic snack, love it! my Aunt has a recipe just like this, so delicious! I think we’ll have to try to make these too! i love that these are baked and so thoroughly breaded (and cheesed). great snack, kevin! what a wonderful idea! this is one versatile recipe. I think I could use any vegetable to make the sticks. My kids are going to love this too. Great, a new zucchini recipe to add to my repertoir. I’ve been making the same zucchini pancakes (posted on my blog) again and again and again… Thanks. These look yummy!! I recently found “for the love of cooking” and I love it but I hadn’t come across this recipe yet. Thanks for bringing it to my attention, it looks like yours turned out great! Bookmarking this for in the summer when it will be needed! I love For the Love of Cooking – her food always looks delicious. This recipe is no exception. These look awesome! I can’t wait to try them! Great pics and site! They look really good! I like the fact that you have baked them rather than frying them. One of my favorite indulgences at the restaurant Carrabbas is zucchini frites. To die for. But very fried in oil. These look like an awesome way to still have the zucchini and not feel so guilty. Thanks, Kevin. I am having friends over for pizza on Saturday and this will make a perfect appetizer! This looks so good, makes me want to head to the store right now and get some zucchinis. My little boys would love this; and I love that they’re baked! Wowee do these look fabulous! I make these all the time! My daughter loves them! TYVM these are awesome! I love zucchini sticks and love that I can do them healthy and baked instead of fried. I just bought two giant zucchini and this will be a perfect way to use them up! Yesssss! OMG! How in the world did I miss this post? These look so delicioso! I can hardly wait to get it together & give this recipe a try! Thank you, thank you, thank you! I just tried this recipe out tonight and it was really really good. And I love your oven roasted tomato sauce too, it's so easy! If anyone else is planning to make them – don't be afraid of making A LOT. I cooked up 3 medium sized zucchini, and I wish I had put in the 4th. And that was dinner for only two people. They went fast. I love this recipe and I thought Id share with you my recipe. I mix some yoghurt with a little olive oil, thyme, oregano and rosemary, sometimes i add some chilli powder too. I dip the zucchini in this mixture, then in the parmiggiano / bred crumbs one, then it all goes in the oven. Last time I sliced the zucchini as it seemed to go more quickly then turning into sticks. I think i like the sliced version better. These came together so fast and tasted as good as they looked. I tried this tonight and used mushrooms along with zucchinis and they turned out great. Yum! Thanks! Making these tonight… they are actually in the oven as we speak, can't wait to try them! I made this is Asiago, but had to up the breadcrumbs to get it to stick better. I also added smoked paprika which added a really nice smokey flavour to the sticks. Yum! I just discovered your blog and I'm so excited to branch out and try your recipes! This is the first recipe I've tested. The result? AMAZING. Of course mine didn't turn out exactly like the ones in your picture but still delicious! Thanks for the new recipe! I made these tonight and they were absolutely delicious! Can't wait to make them for family and friends. Thanks for the recipe! Look forward to making many more of your recipes in the near future. I made these last night. They turned out great! I didn't have the reggiano (sp?) cheese, so I used a mixture of parmesan and mozzarella and whole wheat breadcrumbs. The bread crumbs stayed on surprisingly well. I also heated up a homemade slow-cooker marinara sauce (recipe from budget bytes website). It tasted outstanding together! This is definitely a good substitute for fried pickles! Awesom page you can follow me on my blog…..cookenwithladyb! Can you do this with Sweet Potatoes? I just love so many of your recipes! Anonymous: Sweet potatoes are fabulous like this! Enjoy! I didn't pat them dry, just dredged them in flour first. MMMM!